W Hotel D.C. Launches Living Room “Social Interactive Playtime” (SIP) | Exploring Food & Drink in D.C. Pinstripes, lace, sparkling chandeliers decked out with color changing LED lights hanging from high ceilings, scarlet leather couches, combined with restored original plaster moulding and shutters make for a whole lot of swank that only begins to tell the story of the W Hotel in Washington D.C.
Come in out of the cold between 4pm and 7pm to sit, drink, nosh and mingle with other hotel guests or happy hour goers in an upscale atmosphere perfect for conversing while imbibing with SIP drink and food specials that include gourmet bites designed by Executive Chef Philippe Reininger for $10, select beers for $5, weekly cocktail specials for $10, and select spirits and wines for $8. For a full list of drink and food specials check out the SIP Menu. The W is no stranger to quality food and drink. The hotel houses three star Michelin Chef Jean-Gorges Vongerichten’s J& G Steakhouse. (Listed by the Washington Post as one of DC’s best steakhouses in 2012.) The W was also featured by Adam Richman on his Travel Channel show: Best Sandwich in America for the W’s top-secret triple-decker Club Sandwich by Philippe Reininger. (Grilled herb chicken, applewood smoked bacon, tomatoes, lettuce, avocado, house-made mayo, sunny side up fried egg, served between three slices of toasted sourdough bread.) The W is also home to the POV Lounge, POV Roof Terrace, and the 515 Wine Bar. Of course we have or own recommendations on where to start with the SIP menu. Admittedly we also varied a bit into the non-specialty menu items, and were quite content with the thought of paying full price for some of the morsels. Obviously starting with a drink is kind of a given when you’re out for Happy Hour, and we think the Classic Martini served for $10 on Mondays is a fantastic choice. If you’re less of a vodka person, on Thursdays the Manhattan is the Weekly Cocktail of the day. There are additional full price bar options available including the delicious (and my favorite) Elderflower Daiquiri ($14); a hand shaken drink made with Bacardi Superior Rum, St-Germain, and Fresh Lime. The Cripsy Calamari with Beet Tartar Sauce and Dill is an exceptional first choice for nibbling. 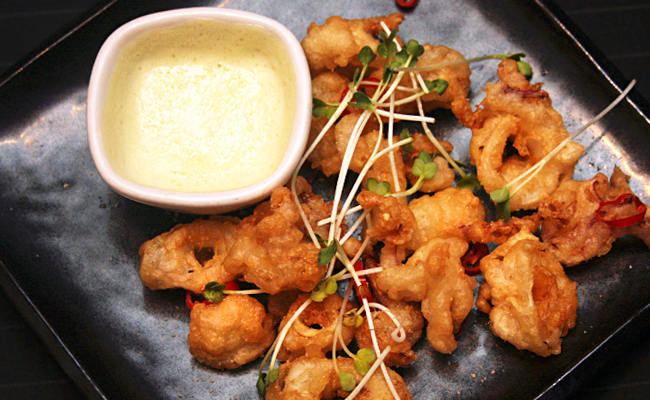 Lightly fried and satisfyingly crispy with a flavorful dipping sauce, the calamari has undoubtedly upped the anti for the next time I’m feeling squid-y. Although the serving is enough for one person’s modest appetite, we think sharing a few of the bite specials is the way to go. We get it. Not everyone enjoys consuming tentacles on a sloshy stomach, so our next and equally delicious choice is the Wagyu Sliders with White Cheddar and Onion Rings. Served in a set of three and cooked to your liking, the cheddar adds that coveted cheesy texture and slight biting flavor that balances the welcomed crunch of the fried onions. Taking a detour from the SIP specials and onto the regular menu, we found the Crab Fritters ($14) served with Old Bay Aioli. While stuffing our faces it was agreed that sometimes crab just isn’t done right. This was not one of those times. Fried to a coppery medium brown, once bitten into the fritters burst through the crisp and ooze with creamy, melty, warm crab meat. For an extra punch of flavor, don’t be shy with the Aioli. For those who aren’t excited by the shoulder to shoulder happy hour scene with pounding music that leaves your ears on the verge of bleeding, just know, your pain is felt. And, the W Hotel’s SIP in the Living Room is a fantastic alternative. The decor provides a starting point for conversation with friends and strangers alike, and 360 degree visual stimulation. (Great place to people watch). The catchy music is set to an enjoyable level that allows for one to hear their own thoughts in addition to whatever the topic of conversation is. The drinks are well worth the price, mixed strong with top notch flavor, and the food…. let’s just say mouths were still watering when it was time to head out. The next time I head back to the W Hotel I’m ordering the Truffled Macaroni and Cheese! 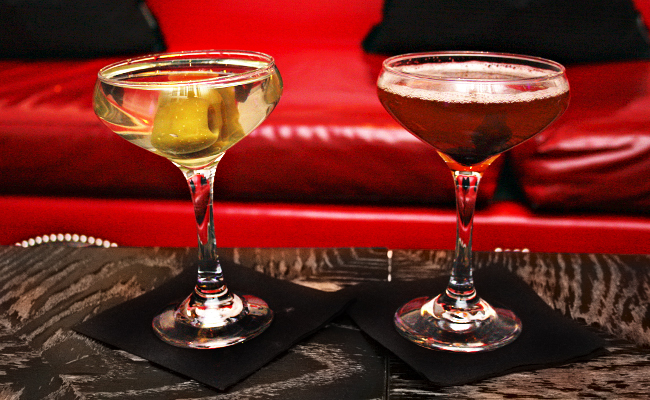 Tags: Executive Chef Philippe Reininger, Happy Hour, SIP, W Hotel Washington D.C.. Bookmark the permalink. Wow, this is certainly a place that I wish I could teleport myself to right now! 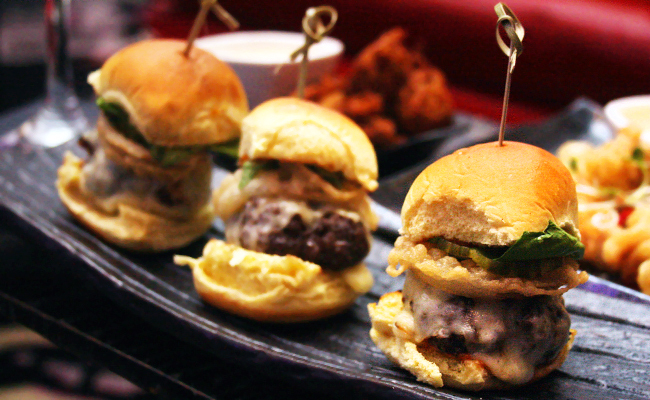 The calamari is mouthwatering, and the Wagyu sliders are killing me right now! they look so good I need them..now! I have stayed at the W Hotels on several occasions and have always been impressed with their food and service. This takes it to a new level! I’m looking forward to my next visit. Pingback: In the Kitchen with J&G Steakhouse: Dream About Dinner, Power Up with Breakfast | Exploring Food & Drink in D.C.
Pingback: Rooftop Riviera: P.O.V. Rooftop Terrace Seasonal Launch Party Debuts Spring Cocktail Lineup | Exploring Food & Drink in D.C.